Creativity is the emergence of something novel and appropriate, from a person, a group, a society. A creative idea or product must be novel. Yet, novelty is not enough (a novel idea may be ridiculous or nonsensical). In addition to novelty, to be creative an idea or product must also attain some level of social recognition. The individualist approaches to creativity overestimate the role of the individual and of his/her abilities (the myth of the genius). On the contrary, the socio-cultural approach emphasizes the role played by contexts in the creation process: societies, cultures and historical periods. Accordingly, the individual is seen as a member of many overlapping social groups, each of them has its own network, with a specific structure and organization, which influences the creation of networks of—potentially creative—ideas. Each individual is also a member of a culture, which gives him/her the categories used to understand the world. Finally, each individual is representative of a specific historical period. 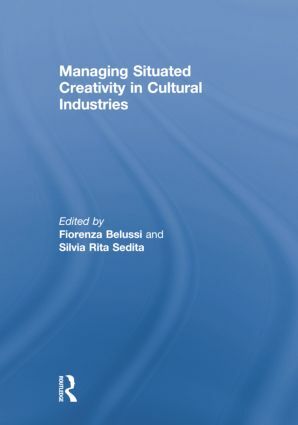 From a managerial perspective it is important to deepen the knowledge of the contexts, both spatial and cognitive, which favor ‘‘situated creativity’’ in the realm of the cultural industries. This special book offers both theoretical and empirical contributions in an attempt to build such knowledge. Fiorenza Belussi, PhD at Spru, Science Policy Research Unit (University of Sussex, UK), presently Associate Professor of Economics and Management, Faculty of Political Science, University of Padova. Main research interests: management of innovation and creativity, international business, firm dynamics in low-tech and high-tech sectors, industrial districts and clusters. She published, among others, in International Journal of Technology Management, Futures, European Planning Studies, Research Policy, Cambridge Journal of Economics, Urban Studies. Silvia Rita Sedita, PhD in Economics and Management of Firms and Local Systems, presently Assistant Professor of Economics and Management, Faculty of Political Science, University of Padova. Main research interests: industrial districts, clusters, creative networks, communities of practice and inter-organizational learning. She published articles in international edited volumes and scientific journals such as Research Policy, Urban Studies, European Planning Studies, Industry and Innovation.